Welcome to the DeNami Design Bright, Bold, & Beautiful Blog Hop! Today the DeNami Design Team and customers alike are showcasing some beautifully bright and bold projects made with DeNami stamps. Don't forget, there are some super-fun DeNami prizes to be won! 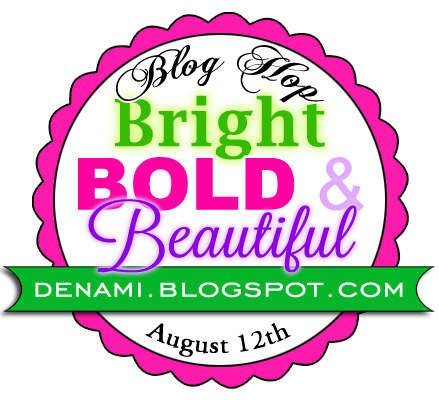 Two lucky commenters will be drawn at random from among the comments left along the blog hop to win a $20 DeNami Design gift certificate! You have until Monday, August 13, 2012, 11:59 pm PST, to leave comments on all the blogs to be eligible for a prize. OK, so on to my bright, bold, and beautiful project! When I think "bold and bright," I think NEONs, which are so totally hot and on-trend this summer. So I reached for a pack of neon-hued cardstock and my trusty, summery, bold, bright, and, dare I say, "neon-y" 6 x 6 pad of Lime Rickey patterned paper from BasicGrey. I just LOVE paper-piecing this giant DeNami butterfly! It certainly is beautiful, isnt' it? And bold and bright, too, right? The dotted scallops border that I stamped in white comes from the very useful Retro Borders 1 set (cling-style). I hope you are enjoying the hop and gather lots of bright and bold ideas along the way! 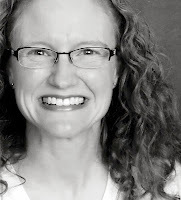 Before you leave, be sure to leave a comment to be eligible for the randomly drawn prizes and then you can be on your way to the next stop on the hop, the blog of Stacy M., Sweethearts & Sweet Tarts. Emily, love how you paper pieced your butterfly! Such a bright and beautiful card! This card is soooooooo awesome!!! Fantabulous paper piecing!! Love the bright, summery colors. I really do love paper piecing - great work! The design, the colors, everything, is absolutely beautiful! You always do gorgeous work with that big bold and beautiful butterfly! Keep on inspiring Emily! Great card. I love butterflies. How cute! That large butterfly is perfect for paper piecing isn't it? I almost used that butterfly image for the hop. SO glad I didn't. I couldn't have done it justice compaired to your masterpiece! Love it!! Love the colorful butterfly Emily!! Awesome paper piecing!! Love the paper-piecing! Super fun card. Love that big, bold butterfly! Gorgeous! Great idea to paper piece it! Great card! i LOVE the different patterns to make up the butterfly.. Fantastic! I love the butterflies too! And only these bright colors really will do them right! Fun card! Such a fun card, Emily! You are the queen at paper piercing this butterfly! Bright, Bold, Beautiful & BIG! You totally captured the retro dynamic here, great card! I love your paper piercing! Such a beautiful butterly! I love the stamped border on the bottom, so pretty! Oh my gosh...that is one cute card! Love your butterfly! This is so gorgeous, and it really makes me want to buy that butterfly stamp now! Neon is in, baby :) Lime Rickey is the perfect pp to go with - love the layered sentiment, and the great dotted border! I love your butterfly! I have the same stamp, I'm going to try the paper piecing! Beautiful butterfly, cool colors, and I love the scalloped border. Super card, Emily! Such a pretty card. LOVE the bright and beautiful butterfly my friend. Cute card! Love the dotted scallops! Love this! So bright, bold, beautiful and funky! Great paper choices! like how you paper pieced the butterfly and the cute dotted border. Great job of paper piecing! That PP is perfect for that butterfly! I LOVE that big bold bright butterfly Emily! Wow, that bright yellow looks great on pool blue! That butterfly just begs to be paper pieced, doesn't it? It looks wonderful in the 'neon-y' shades! MOAV 2: The Adventure Continues . . .